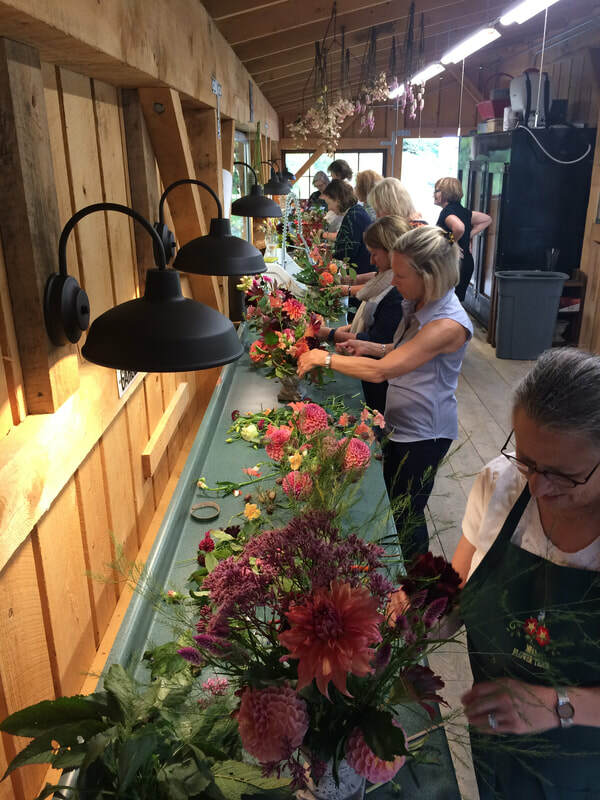 Welcome to Vermont Flower Workshops at Maple Flower Farm! Liz Krieg is a natural born instructor with twenty-five years of teaching under her apron. She is a well known horticultural educator. She has lectured at flower shows, events and garden clubs throughout New England, and has taught as an adjunct professor for New England Wildflower Society (NEWFS) for various accredited classes. Gather your flower buddies for a memorable day of fun on a small working flower farm in the heart of beautiful Vermont. What could be better than to learn and enjoy flower craft among like-minded people! You’ll be educated and entertained by Liz inside our lovely new flower studio. While strolling through the beautiful gardens, chat about your flower dreams and receive answers to your most vexing questions. Create your own masterpieces and bring them home in quality containers. Enjoy delicious home-crafted foods and sip delightful drinks throughout the flowery and fabulously fun day.